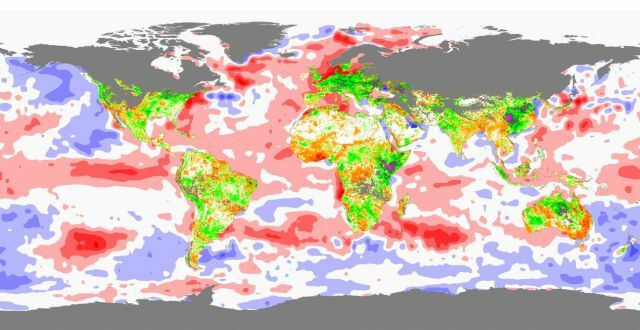 Sea Surface Temperature (SST) Anomaly color scale. Vegetation Anomaly percent color scale. Rift Valley Fever is passed by mosquitoes from viral reservoirs in bats to livestock and people. The 2006-2007 Rift Valley Fever outbreak spread through Kenya and Somalia, killing 148 people and infecting many more, causing costly closures of livestock markets and costing the Kenyan government $2.5 million for vaccine deployment. The cascade of factors that ended in the death of many emerged from the record-breaking climate extremes of 2007. The map above from NOAA’s National Climatic Data Center shows a few of them. Click it for a larger image.